In June 2000, Microsoft coined the term “Web Services” when they introduced this as one of the key component of its .NET framework. As other industry players started adopting this, it was evident that this technology would revolutionize distributed computing in the coming years. In the past few years many techniques have been developed to help applications interact with each other, of which prominent one is Web Services by a large extend. Spring Web Services (Spring WS) follows the strategy of contract-first web services. It focuses more on XML and lesser on Java implementation. The underlying details are completely under the control of developers starting from the contract to the marshalling/unmarshalling details to the endpoint which actually handles the request. Spring WS being a product of the Spring Framework, offers first class support of using Spring configurations and integrating with Spring framework. It provides ability to plug-in various XML APIs (SAX, DOM, StAX, XOM, and JDOM) to handle XML messages and can always ensure that the XML contract is marshaled correctly into Java objects. It supports JAXB 1 and 2, Castor, XMLBeans, JiBX, and XStream as part of its XML marshalling support. When you have finished with this Chapter, you will have clear idea of all the terminologies related to web services and will also have a clear idea of the support provided by Spring to create and use web services in your application. A Web service is a method of communication between two electronic devices over the Web (Internet). A Web service is a unit of managed code that can be remotely invoked using HTTP protocol which allows exposing the functionality of your existing code over the network which other application can use it. To give you a better explanation of what a web service is, I would like to give you the exact working of web service pictorially shown in Figure 16-1 below. The client (web service consumer), queries the UDDI registry to get the details of the service and to locate it in the network (Internet). 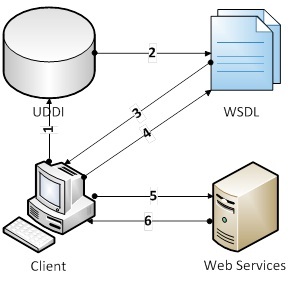 The UDDI registry refers the web service requesting client to the WSDL document details. The requesting client accesses the WSDL document. The WSDL document gives all the relevant details of the requested web service to the client. The client now sends SOAP-message request to the actual web server exposing the service. The web service returns the SOAP-message response which the client receives and does the appropriate processing. Spring hides many of the web service complexities away from the developer. But since some concepts are very crucial in overall understanding of web services, we’ll take a brief look at some these concepts in the following sections. Method call – it contains name of method and parameters. Method Response -contains the return values. The SOAP message structure is illustrated in Figure 16-2. Enterprise application requires many services to realize various uses cases. These services are mandatory and form the backbone of the application in many ways. Changing business scenarios requires changing and updating these services at various changes according to demand. With Spring’s capability, this can be achieved very easily catering integration with evolving opens-source technologies and solutions. This part of the book contains Chapters which will help you in developing enterprise application having all the required enterprise services helping you realize business use case with the help of Spring Framework. Chapter 16, “Web Services – Spring WS”, introduces you to the Spring’s capability of supporting web services in your application. After reading through this Chapter, you will have clear idea of all the terminologies related to web services and will also have a clear idea of the support provided by Spring to create and use web services in your application. Chapter 17, “Messaging with Spring”, will initially cover messaging concepts in some detail. Later on we will cover JMS and its components in detail. We will then deep-dive into the support provided by Spring in applying messaging to your application. We will then go through the transaction support by JMS and again what Spring has to offer in this space. Last but not the least, the Chapter concluded with introduction and Spring’s support in achieving global transactions in your application. Chapter 18, “Remoting”, we will first go through the basic concepts in remoting and then go on to the support provided by Spring. We will then go on in detail to cover the various remoting technologies which Spring supports in detail. Chapter 19, “Tasks and Scheduling”, initially looks into the various concepts dealing with concurrency and then looks into Java support for doing this. Later on it looks into how Spring Framework can support doing this in your application. You should also be able to configure and use Quartz in your Spring application as well have the capability of using JDK’s timer support in your application. Chapter 20, “Spring Integration”, will help you start with Spring Integration and will aid you in achieving the various integration requirement in your application. I am sure after reading through this Chapter you will have one more weapon up your sleeves which you can use and reap benefits from its high level of integration capabilities. Chapter 21, “Spring Batch”, similar to other chapters will introduce you to Spring Batch in a comprehensive manner. Batch operation is one among the integral parts of modern day application and Spring’s support comes in the form of Spring Batch and we will deep dive into this in all aspects possible.